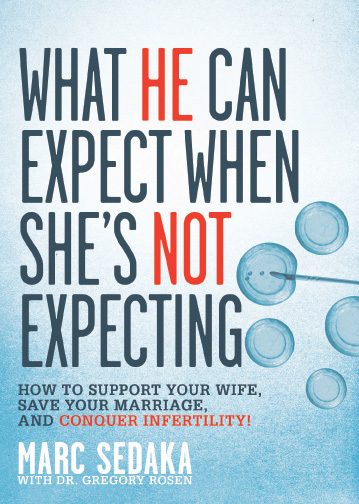 While no two women will react to infertility in exactly the same way, there are a few universal “truths” that, at least in my experience, seem to apply to all sufferers. Listen closely, guys. These are the pearls. If I could tattoo them on your arm, I would. Sounds completely contradictory, doesn’t it? But it’s true. By and large, women struggling to have kids will do everything in their power to avoid being around them. It’s just too painful. Too much of a reminder of what they don’t have. In my own case, this became a real problem after a while. We had to avoid family movies and TV shows. We drifted apart from close friends with children. I even made the difficult choice to not invite one of my wife’s best buddies to her surprise 35th birthday party because his wife was six months pregnant at the time (sorry, Gary). That’s how overwhelming this aversion had become. Just be conscious and considerate as your wife starts to fall prey to it, and do whatever you can (within reason) to respect its limitations. Again you’re thinking, What the hell? Haven’t I been stressing communication this entire time? Yes, I have. Communication with you. Not your friends. Not your relatives. And especially not your poor grandchild- deprived mother. So along with being supportive and understanding, your job description must also now include running interference every once in a while. I wouldn’t go so far as to tell your friends to “shut the hell up” whenever they ask your wife how it’s going, but a quiet aside after the fact would certainly go a long way to making her more comfortable and secure. Now, this isn’t to say that they themselves won’t constantly compare themselves to other women. They will. Ad nauseam, in fact. It’s only when you (or anyone else for that matter) make the comparison that they turn into Linda Blair from The Exorcist. Think of it this way: How would you like it if you kept getting passed over for the same promotion at work and, in order to make you feel better, your wife kept telling you about all the other husbands who had absolutely no trouble whatsoever getting promoted? I can remember my mother (who, by the way, has a fantastic relationship with my wife) constantly telling us how easy it was for her to get pregnant with me and my sister—as if somehow this ability would magically transfer to my wife through some sort of fertility osmosis. Similarly, don’t think the success stories—you know, women just like her who persevered—will go over any better. If anything, they’ll only elicit a “why them and not me?” reaction. And the failures? Hoping that maybe she’ll appreciate the “misery loves company” aspect? Nice try, genius. But that one’s just gonna make her cry. In the end, when it comes to comparisons, your best bet is just to shut up and let her do all the talking. You know . . . like the old days. Remember those truths. Memorize them. And be sure not to mess with them as you stumble forward on the bumpy road ahead.